Big News: An SCV Tasting Room on the Horizon? After the Loose Goose closing I have been waiting to hear good news within the wine industry. Well………I have big news for you. I have been tracking changes in the LA county rules on opening a winery and tasting room. LA county is almost complete with a new ordnance to simplify the process for everyone who is serious about owning a vineyard or winery as a business. In a few months, if you are outside city limits, have over 2 acres, are A-1, 2 or industry zoned and have a few thousand dollars burning in your pocket, LA county is going to allow you to open a winery to produce up to 5000 cases (if you meet all the requirements of course). I can explain more if anyone is interested, just contact me. The new laws are approved and being finalized now! There will be many wineries opening in our area in the next few years because of this, I promise. This is what all of us serious wine geeks have all been waiting for the county to do. I never thought I would say this but good job politicians, you listened and realized that there was an opportunity for revenue if you updated your laws. Well, we will be more than happy to hand you the revenue if you allow us to simply fulfill our dream of owning a winery and sharing our passion with the rest of the wine world. Once again we had a great showing of some great wines. We overlooked Miles comments in “Sideways” and found that their is a lot to be offered. It is quite obvious that when one looks at the success of the French Bordeaux’s. I don’t know of anyone that would turn up there noses if offered a glass of Chateau Petrus. Chateau Petrus located in Pomerol is one of the smallest production area of the major Bordeaux appellations, meaning extremely limited supply of these wines, leading to high prices for the most sought-after wines. 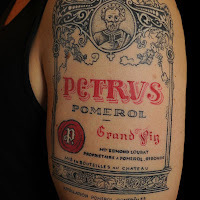 It owes its fame due to its particular perfumes of truffle, its aspect of black ink which has given Petrus the nickname of Merlot blood. The bottom line is that there are some phenomenal Merlot wines available. Our group chose not to venture outside of California for our tasting this week. There was however, some great wines with very unique characteristics poured. Before I get too far ahead of myself, lets talk about the history and characteristics of the Merlot Grape. We can trace Merlot back to the 1st Century in France, but Merlot as a noble Bordeaux varietal standing on it’s own doesn’t appear till the 1800s. Merlot, Malbec and a few others owe their existence to the ‘biturica’ variety from which it has evolved. Researchers at the University of Davis believe that Merlot is an offspring of Cabernet Franc and is a sibling of Carmenere and Cabernet Sauvignon. The earliest recorded mention of Merlot was in the notes of a local Bordeaux official who in 1784 labeled wine made from the grape in the Libournais region as one of the area’s best. The name comes from the Occitan word “merlot”, which means “young blackbird” (“merle” is the French word for several kinds of thrushes, including blackbirds); the naming came either because of the grape’s beautiful dark-blue color, or due to blackbirds’ fondness for grapes. By the 19th century it was being regularly planted in the Medoc on the “Left Bank” of the Gironde in France. Other names for Merlot around the world include: Petit Merle, Vitraille, Crabutet Noir and Bigney. In a further twist of mistaken identity, DNA profiles reveal that some wines from Chile labelled as Merlot come from a vine called Carmenère or Grand Vidure. Carmenere is the subject of both debate and curiosity. Carmenere was widely planted in Bordeaux in the early 1700s, but disappeared from French vineyards in the late 1800s due to a one-two punch of declining popularity (growers began pulling it because of problems with ripening) and phylloxera. When replanting began, the French turned to more promising varietals and Carmenere was eventually forgotten. If you have never tried a wine made with the Carmenere grape, I highly recommend Montes Purple Angel from Chile. Tracy and I love this wine, but it can be difficult to find. Merlot is an early ripening variety. This is wonderful as it will ripen before the winter rains set in. Also this is terrible as it is vulnerable to spring frosts. It tolerates and even thrives in soils too poor or too moist or too cold for top class Cabernet Sauvignon. The colder climates produce wonderfully complex Merlots with lots of soft fruit flavors not found in the warmer climate fruit. Unfortunately, we did not have a French representative at our tasting, but for those that have tasted a Merlot based Bordeaux compared to the Napa examples that we tasted, this statement is true. My personal love for French Bordeaux’s lie in the complex nature and the multiple layers of flavors that they exhibit. They are also very soft which is the nature for the Merlot grape. Quite different than the fruit forward examples that California produces. The Merlot berries are thin skinned and physically large. They don’t tolerate bird damage or sunburn or splitting, as they’ll rot as soon as any moisture finds the damaged berries. As discussed earlier, Merlots most famous home is in Bordeaux, France. Even the Medoc region, famous for its Cabernets has about 40% area under Merlot. Merlot comes in third behind Carignan and Grenache as the most planted red grape variety in France. It thrives in northeast Italy, and is spreading through Eastern Europe and into the new world regions where they cannot produce enough. Merlot is a doubly versatile grape. It is widely blended with many other grapes providing a soft, luscious, velvety fruit characteristic softening the harsher varieties. This makes for extremely drinkable young wines. Cabernet Sauvignon and Merlot is our best-known blend with tannins and structure from the Cabernet Sauvignon and a fruity rich middle palate from the Merlot. The most famous producer of French Merlot wines is Chateau Petrus, whose 1990 bottling earned a perfect 100 score from Wine Spectator (it sells for about $1,700 a bottle). Ouch! Merlot on its own is not great for long bottle aging. It’s become ridiculously popular in the last few years as a stand-alone varietal. 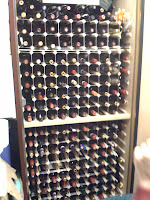 More so among people wanting a ‘drink now’ wine rather than a long term cellaring wine. Ripe Merlot gives you lots of fruit flavours; plums, cherry, raspberry, mint and subtle spice. However unripe Merlot, goes towards herbaceous green flavors. During the tasting, we saw that the Gainey had a floral nose and the Hill Family Estate had Eucalyptus and Menthol on the nose. Is this the result of the grapes being harvested too young? Open for comments on this one folks. Aroma: High Alcohol , Peppery, Bell Pepper, Light strawberry with spice, raspberries. A blend of 96% Merlot and 4% Cabernet Franc. Our 2005 Twomey Merlot is a voluptuous, robust and balanced expression of this noble variety. It has a deep garnet color and an intensely concentrated nose of black cherry, blackberry essence, wild game and freshly ground black pepper. On the palate, it is full-bodied and velvety, with fine-grained tannins and an extremely long finish. This Merlot will continue to give drinking pleasure through 2018. As a side note, Twomey is produced by the Silver Oak Winery which are well known for their Cabs. “The 2004 vintage for Merlot was outstanding, except for not providing us enough Home Ranch fruit. Fortunately, we were able to supplement our estate grapes with fruit from other Santa Ynez Valley ranches, resulting in a Gainey Merlot full of complexity.In the nose, cinnamon-spiced berries leap from the glass, followed by blackberry essence, subtle earth tones and sweet herb scents. The signature Gainey minerality is also present. Sweet creamy oak, with just a wisp of smoke, caresses the fruit, with beautiful cassis notes emerging on airing to round out the package. On the palate, exuberant flavors of ripe, juicy berries are balanced by ripe tannins, which contribute to the wine’s plush texture, and offer structure and depth to the memorable finish. John Schreiner : 88 points. Hillside first added a reserve Merlot to its extensive portfolio in the 2002 vintage when the winery was able to buy grapes that showed “intense fruit concentration and fabulous ripeness levels”. That was a muscular wine with 15 percent alcohol and a concentration of flavours that marked Hillside’s emergence as a red wine producer worthy of notice. The 2004 reserve Merlot is also made from grapes purchased from several south Okanagan vineyards. Individual lots were kept separate until the final blend was put together. 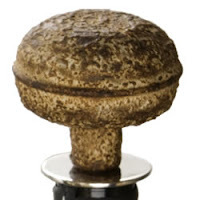 The wine was aged for nine months in a combination of newer French and American oak barrels. The finished wine has 13 percent alcohol, much more appropriate for a food wine than the huge 2002. The current release (950 cases) has all the power it needs. The wine has a rich, chewy texture, with aromas and flavours of black currants, blackberries and chocolate. The long, ripe tannins give the wine, while it is ready now, the structure to age for five to seven years. I hope that everyone enjoyed the Merlots tonight. They were all great and offered differences even though they were all produced in California. I also hope that we all don’t fall into the group like Miles from Sideways and turn up our noses when offered a glass of Merlot. As a frequent traveler, Airlines, hotels, etc are always offering Merlot. This is probably based on the fact that inexpensive versions are not tannic and very smooth. This is what people generally look for. More so if you are not into wines where you are considering wines for long term investments. I feel this is why Australian wines have taken off. They are fruit forward drink now wines at a low price. How can you beat that? Aykroyd, Banderas and where’s my wine tattoo? Dan Aykroyd’s Sonoma Project is on Page 81 of the May 31 edition of my Wine Spectator. I’ve always loved Aykroyd…but not to the point that I can write his name easily. Only to the point that I know he’s not Bill Murray. He married the hot actress from Bosom Buddies while Bill Murray scored Scarlet J. in the movie Lost in Translation. Guys I could do tequila shooters with. In my wildest fantasy? Yea, maybe a Sangria. Oh…wait…that’s the other wine aficionado/actor/old hot Spanish dude. Yes, that would be Antonio Banderas and he has a winery too. 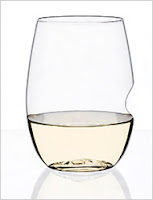 Or, what I actually read, “was stung by the wine bug”. I get it. Just like when Brad Pitt adopted New Orleans and his wife adopted a child from every country under the charm of UNICEF…having a celebrity champion a cause brings it to the forefront for the masses. But, forgive me if I’m wrong here. I don’t need a celebrity to show interest in my cause. I’m just wondering if other Wine 101er’s do. Because it’s no longer just the Aykroyds and the Banderasses (pun intended). The Ed Hardy brand, of amazingly colorful tattoo art fame, is now putting said art on wine bottles…at Whole Foods market. The LA Times says the wine “isn’t half bad”. Does that mean Wine Spectator would rate them at about a 50? I think anyone with a wine interest, and a million-friggin’ dollars worth of money and taste, can hire a great winemaker. The winemaker can purchase the best grapes and be given all that he desires to make wine. But Hardy? Known for tattoos, clothing and wine…gee…does that mean that I would want to get a tattoo of a wine bottle on my rump in exchange? That we are on the same page in relation to wine interests? Am I being a snob here? Eve, We have met and have taken all the ideas into consideration. We have agreed on an approach and name. Could you please let everyone know that we have decided on a name and we will publish the results to you, face book members and club members probably next week. (maybe by Thursday so you can publish it Friday if you would like.) We need to secure the DBA before we announce the new name. Thanks sooooo much with all the help. We got bad news last week. 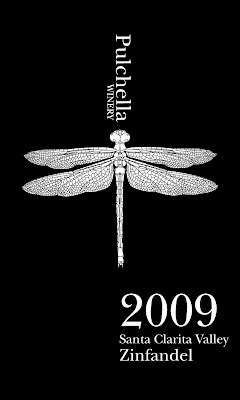 It appears that the Nickel and Nickel company hold the rights to the word “dragonfly” used in any context within the wine industry. Their lawyer has asked us to stop using the name immediately. As we respect their request, its not news we were expecting. This means we are going to have to come up with a new name for Dragonfly Winery and relaunch the label. We are going to keep the logo and layout of the label exactly the same but we are going to have to replace the name with something else. As you know, it took years for us to come up with a name so it won’t be an easy task seeing we are passionate about the name and brand. Any ideas on a name that works with our logo and label? Let us know, we are open to suggestions. Maybe your readers have some ideas??? That’s the latest. I wish it was good news.